Over 800 Asian works of art spanning 4,000 years of history sold at Sotheby’s New York this March. Spread across eight auctions, the sale series totaled $45.7 million, with collectors from America, Europe and Asia bidding competitively to take home these treasured objects. 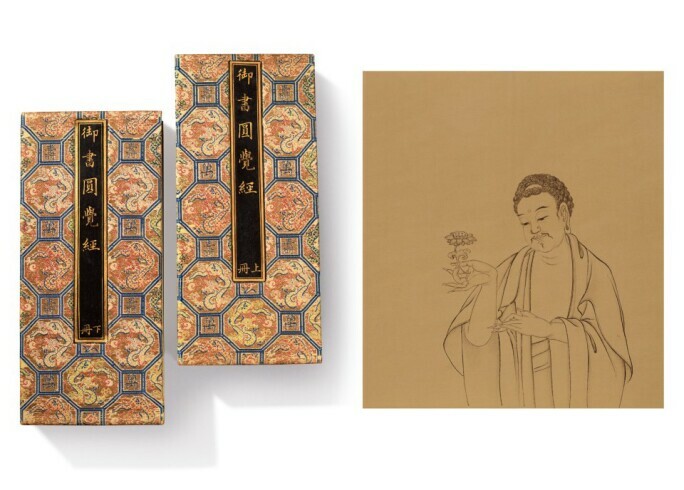 The week’s top lot was the exceptional handscroll Poems on Falling Flowers in Running Script by the Ming Dynasty master Shen Zhou, which achieved $3 million against its estimate of $1.2 – 1.8 million. An exceedingly rare and important complete set of The Sutra of Perfect Enlightenment, written by the Qianlong Emperor himself, soared past its estimate of $300,000 – 500,000 to sell for $2.7 million. Setting the world record for a Tibetan painting, a rare and finely painted 14th century Tibetan thangka depicting a Havajra Mandala achieved $2.4 million. Modern and Contemporary South Asian Art was led by Francis Newton Souza’s Golgotha in Goa, which achieved $437,500. Scroll down to explore the diverse Asian works of art offered at Sotheby’s this season. To learn more about the market or Sotheby’s Asian art sales, contact us or submit and estimate request. Please visit our Chinese Works of Art, Classical Chinese Paintings or Indian, Himalayan & Southeast Asian Art consignment pages to contact a specialist, or email asiaweek@sothebys.com.